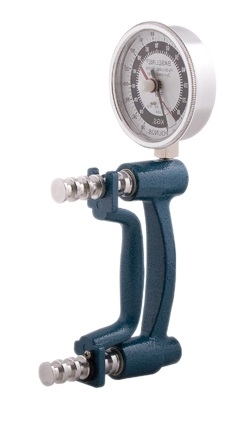 Baseline HiRes ER hydraulic hand dynamometer has a large 300 pound capacity (136kg); along with an extra large analogue dial for easy to read measurements. 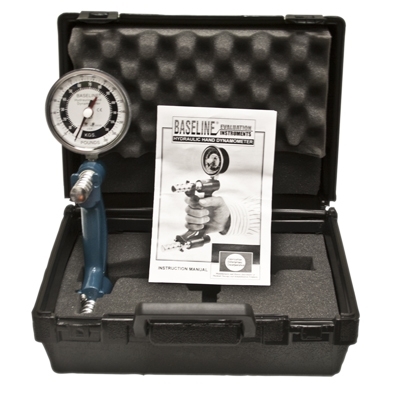 Baseline hydraulic hand dynamometer gives accurate grip strength readings without the subject being able to "feel" the handle move. The internationally accepted design ensures reliability, user convenience and measurement repeatability. Maximum reading remains until the unit is reset. Five position handle and body design yield results that are consistent with published Baseline and Jamar studies. The strength reading can be viewed as pounds or kilograms. CE Certified. Comes in a protective carrying case & 2 year Warranty.